MNM Developments approached us in the middle of last year, to assist with interior design, furniture and fit-out plans for their new offices in Edinburgh. The brief was to design an office interior which reflects the quality of the luxurious property developments that they are renowned for and to have a relaxed, comfortable feel. With this in mind, we designed a bright and modern homely working environment, carefully selecting products and finishes to reflect the client’s vision. The reception desk is finished in Light Grey Concrete echoing the use of building materials used in construction, along with the unique “Rebar” console table in the boardroom, which provides the contrast between the beauty of wood and raw industrial metal. A glass screen partition featuring their corporate logo provides a backdrop and separation to the office but still maintains an open plan feel. Grey Seagrass vinyl floor has been Herringbone laid mirroring the pattern of the MNM brand. Soft seating has been upholstered in pure new wool fabric made from premium New Zealand lambswool in tones of greys and soft blues. That together with the beautifully rich and deep shade of walnut on the desks and custom-made storage provides warmth and a luxurious feel. Feature Linear lighting in walnut and concrete compliments the finish of the interior. To top it all off, our client said of us “Amos Beech brought our vision to life and made the most stressful process not as stressful as we had originally thought”. I suppose if you are an internet based company you are going to use the internet to find your own suppliers and that is what BlackCircles did when they embarked on an office relocation and fit-out. We were contacted and arranged to meet with the senior management team in one of Edinburgh’s coffee shops to discuss their plans away from the eyes and ears of their staff as it wasn’t yet public knowledge. As is often the case, we went through a couple of potential locations and then settled on what seemed like the ideal space only to then hear that the company who was moving out of the suite was now staying. So back to the drawing board and the next door suite was selected. To be fair, the space was a much easier shape to work with and it is also larger so the cloud had a silver lining but other challenges were looming. A bigger space but no more budget! So maximum creativity required – step forward the design team and bring about a functional, minimalist space with just enough accents to keep Nick happy – whose eye for detail and nose for a bargain is the stuff of legends. Some pretty clear lines were drawn and making the best use of space as well as planning for their future growth, a design emerged. Making sure that the natural daylight was allowed to filter through from reception whilst retaining some privacy for the office staff was achieved using some material more associated with conservatories, but the result is spectacular. Allowing the staff the opportunity to work away from their desk was another consideration and various spaces have been incorporated to include quiet/concentration space, more open collaborative areas and a town hall space with tiered seating where the staff can gather for company announcements. BlackCircles parent company is Michelin and another component of the project was branding – the desire to have it but not in an overt way. Using the original inverted M design from Michelins first tyre design, we have created window manifestation for the meeting rooms. Shared components on the Samuel Bruce Team Bench desk design kept the cost per workstation down and allowed BlackCircles to specify the award winning Drumback from Viasit for all their operator chairs. 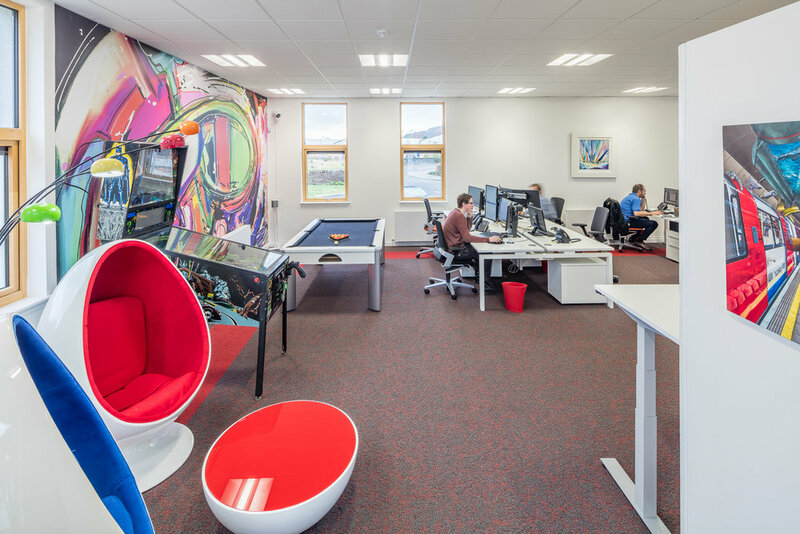 Highlands and Islands Enterprise have built a new business unit in Dunoon at Sandbanks Business Park and following a public competition on the Scottish Governments PCS webportal, Amos Beech were successful in winning with their interior design and furniture offering. The design team carefully researched the building including visiting at an early stage to get a proper ‘feel’ for the space that allowed them to develop an interior design and furniture proposal that caught the attention of HIE. The brief was to create a ‘front of house’ reception space that also could be used by any one of the multiple tenants who occupy the building. By asking questions and applying our experience we developed the space to a point where it has become an informal ‘town hall’ space at the centre of the building. Amos Beech included a coffee station within their design and worked with a local commercial coffee machines and consumables provider to ensure that the only headaches were ones from too much caffeine! The design encourages the creative staff from all the different business units to come together in the space and by sharing ideas and experiences, many new ideas come to light. This is very much in keeping with the very latest ‘café working trends’ that are proving so popular in the happening cities of the world. A purpose designed welcome desk, greets visitors to the building and the tablet provides a very simple way of checking into the building and sends a message to the correct business that their visitor is waiting for them in reception. The elegant furniture selected by the interior design team are complemented by a wonderful piece of artwork on the wall facing the front doors. A professional photograph taken before digital photography was an option has been digitised and enlarged and gives a timeless and dynamic presence to the space. The Longo seating provides comfortable and relaxed seating whilst minimising the frame work required to support and this helps to maintain the light and airy feel. To one side of the roof atrium there are a selection of coffee tables and chairs that offer a range of seating choices. With an elegant fusion of timber and solid colours in combination with the flooring detail, this is a space where visitors and staff are happy to linger, mingle and swap experiences and ideas over a cup of cappuccino. A bookable meeting room is also provided within the space with a Verco DNA table and cantilever frame meeting armchairs. The first tenant is already installed and BC Technologies selected Amos Beech to provide them with modern office furniture and Wilkhahn ON 3D task chairs. The result achieved is reflective of this exciting and tech driven computing firm with a bright and funky office space that offers the staff an ideal working environment alongside the shared space the other side of their office door.